Anxious though we are to see Breaking Bad star Aaron Paul, Hannibal chow Hugh Dancy, and True Detective alum Michelle Monaghan get back to work on Hulu’s new drama The Path, the streaming giant is not making it easier to discern what this new cult is all about. Open the eye for yourself in a new teaser poster and featurette! In addition to the cryptic new poster, a new featurette goes behind the scenes with its all-star cast to reveal some secrets of the “Meyerism” movement, and what may or may not be a genuine religious experience for Paul’s character. For those unaware of the new series premiering in March, Paul takes the role of Eddie Lane, convert to the controversial “Meyerism” movement, while Dancy plays Cal Roberts, charismatic face of “The Path.” Roberts is also entangled in a complicated relationship with Eddie and his wife, Sarah (Monaghan), battling personal demons and bold ambition as he strives to take the organization into its next generation. The series also features Kyle Allen as Monaghan and Paul’s son Hawk Lane, along with Amy Forsyth as his classmate Ashley Fields. Sarah Jones will also play “Meyerism” defector Alison Kemp, in addition to Shameless alum Emma Greenwell as rescued addict and Sons of Anarchy star Rockmund Dunbar as Detective Abe Gaines. Premiering March 30, The Path was created by writer-executive producer Jessica Goldberg, with Parenthood alum Katims and Michelle Lee also producing. 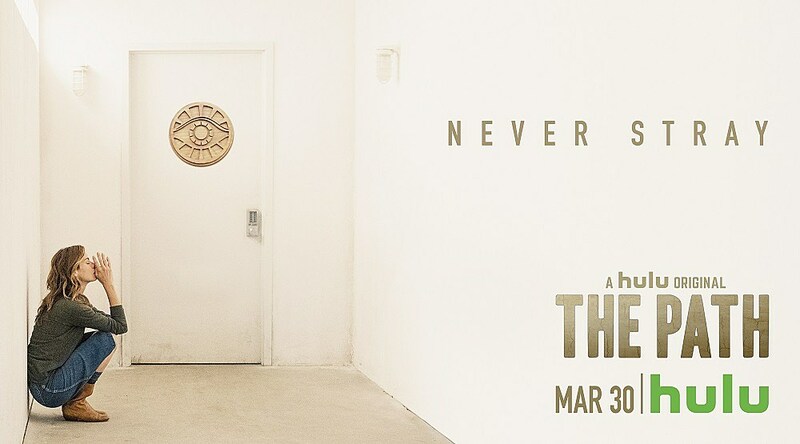 You can check out Hulu’s trailer for The Path below, in addition to the photos, and stay tuned for the latest from its March premiere.